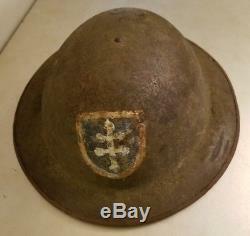 Army helmet is hand-painted with the Cross of Lorraine, the symbol of the 79th Infantry Division. 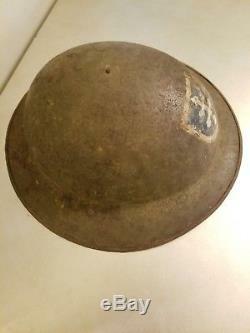 The 79th was activated during World War 1 in1917, and saw extensive combat in the Meuse-Argonne Offensive, where it earned the name "Cross of Lorraine" for its defense of France in 1918. The 79th saw service in both WW1 and WW2, and even exists in a form today as the 79th Sustainment Support Command (SSC) headquartered at Joint Forces Training Base Los Alamitos, California. 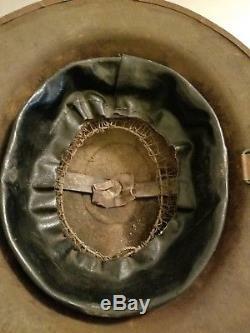 As the pictures show, the helmet exhibits extensive aging and light corrosion, though it remains quite solid and wearable. The original liner is present, but the chinstrap is missing. Please contact me if any additional information or detail would be helpful. 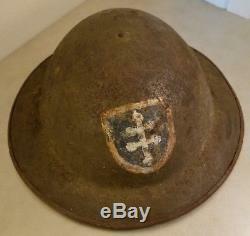 The item "WW1 US Army 79th Cross of Lorraine Infantry Division Helmet" is in sale since Wednesday, October 18, 2017. 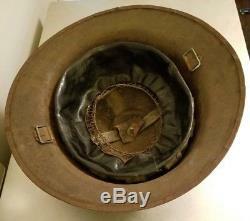 This item is in the category "Collectibles\Militaria\WW I (1914-18)\Original Period Items\United States\Hats & Helmets". 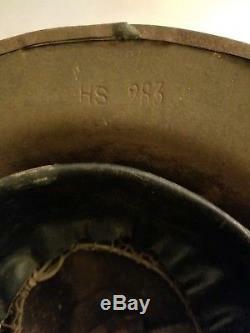 The seller is "eisernerkanzler" and is located in Bloomfield Hills, Michigan. This item can be shipped to United States, Canada, United Kingdom, Denmark, Romania, Slovakia, Bulgaria, Czech republic, Finland, Hungary, Latvia, Lithuania, Malta, Estonia, Australia, Greece, Portugal, Cyprus, Slovenia, Japan, China, Sweden, South Korea, Indonesia, Taiwan, Thailand, Belgium, France, Hong Kong, Ireland, Netherlands, Poland, Spain, Italy, Germany, Austria, Russian federation, Israel, Mexico, New Zealand, Switzerland, Norway, Saudi arabia, Ukraine, United arab emirates, Qatar, Kuwait, Bahrain, Croatia, Colombia.